When we think of Christian Dior today, perfume, makeup, and accessories come to mind, as well as a fashion label that has been successful for nearly 60 years. World War II brought austerity measures to every industry, even fashion. Once the conflict ended, women were ready to shed the masculine look that was so prevalent during the war years. They wanted something new. In walked Christian Dior and his ‘New Look’ (a term coined by Harper’s Bazaar’s editor-in-chief at the time, Carmel Snow). It didn’t take long for his designs and business acumen to redesign the fashion industry, building a legacy that endures to this day. 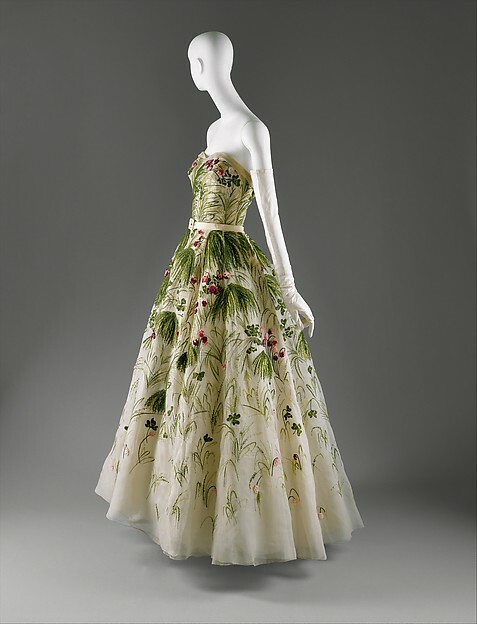 Christian Dior was born in Granville, a coastal town located in Normandy, France, in 1905. The family moved to Paris when he was five, but continued to spend summers in Normandy. He was expected to become a diplomat, but he was an artist at heart. Family pressure won out, and he graduated from the École des Sciences Politiques in 1928. He opened a small art gallery shortly thereafter with funding from his father, on the condition that the business not reflect the family name. The works of Georges Braque, Pablo Picasso, Jean Cocteau, and Max Jacob are among the notable names handled by the gallery. However, by 1931, the deaths of his older brother and mother, as well as financial collapse of his father’s business, forced him to close the gallery. Undeterred, Dior made ends meet selling his fashion sketches, which eventually landed him a position as an illustrator for Figaro Illustré magazine. 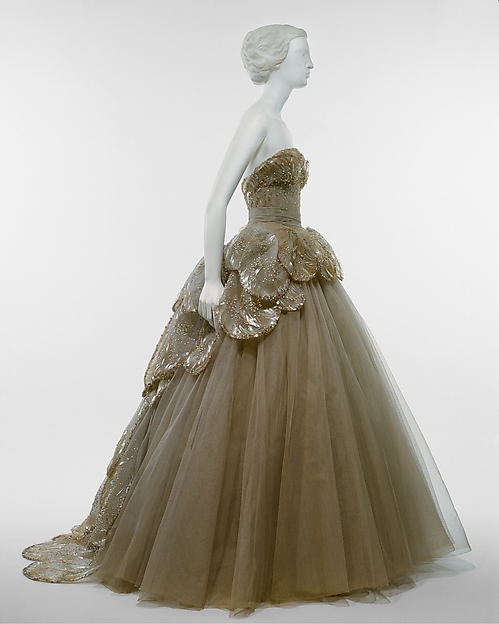 A year before the war started, he was hired by Paris couturier, Robert Piguet, as a design assistant. He left that fashion house at the onset of the war, and served as an officer in the French army in the south of France until France’s surrender to Germany. 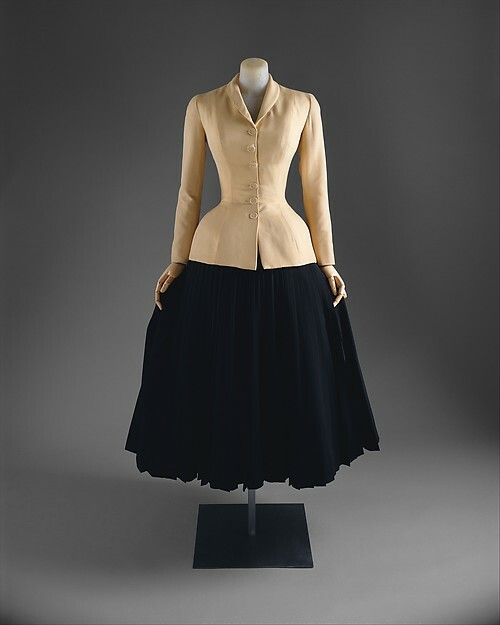 He returned to Paris in 1942 and worked for couturier Lucien Lelong. The fashion house dressed women from both sides of the conflict. His reputation grew as a designer during this time and in 1947, with the backing of Marcel Boussac, who was known as successful entrepreneur and the richest man in France, Dior established his fashion house and presented his first collection, Corolle, on February 12. From that moment on, the fashion industry was forever changed. He enveloped women in yards of fabrics, creating shapes and silhouettes reminiscent of the fashions worn by his mother as a child; shapes born out of the Victorian era and updated for women of the mid-20th century. He used mostly percale to line his garments. He also used boned bustiers, hip padding, corsets, and petticoats to create a curvaceous form. His designs covered up women’s legs, which brought about some protests, as did the amount of fabric used in each garment. Conservation measures in everything, including clothing was still winding down after the war and vendors were concerned he was being frivolous in his use of fabric. Christian Dior’s career was cut short on October 23, 1957, when he died of a heart attack (his third) while vacationing in the Italian town of Montecatini. In ten short years, he revolutionized the fashion industry and helped reestablish Paris as the center of the fashion industry. According A&E’s Biography website, “… Dior’s funeral was attended by an estimated 2,500 people, including all of his staff and many of his most famous clients.” Following his death, his assistant, Yves St.Laurent, took over as head of the company.